A new slide leak from AMD has detailed a bunch of new info on AMD Bulldozer (Zambezi-FX) Processors and the upcoming 9-series chipset “Scorpius” platform. The new platform would be marked under the AMD’s new “Black Vision” Label. The slide details some specifications of the AMD Bulldozer based CPU’s which will fall under the new label, Those will include 8 Core Processors based on 32Nm process featuring new and improved Turbo Core enhancements. Production of sample chips already started back in March 2011 and we already reported performance of a few engineering sample which you can view here. 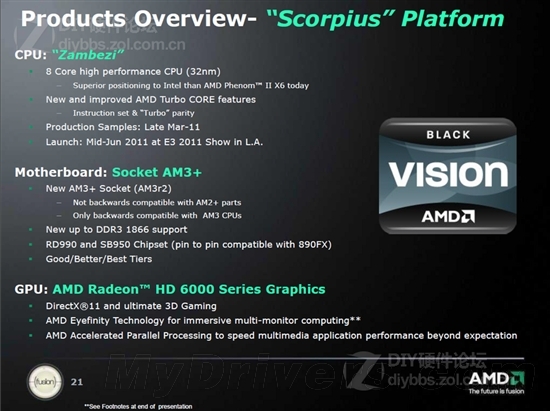 The Launch date of the AMD Bulldozer (Black Vision Label) CPU’s is scheduled to be held at E3 2011 event at L.A. Along with this details on the new AM3+ Socket (AM3r2) have also been mentioned, The socket would be compatible only with AM3 CPU’s while AM2+ parts are not backwards compatible. From a recent pricing chart leak which you can see here, It was clear that the new motherboards/ CPU’s will offer DDR3 memory support with frequencies of upto 1866Mhz. The new motherboards would be based on the 990-FX and SB950 South-bridge chipset.